All photographs displayed on this site are owned by me, or I have gained permission from the copyright holder for them to be re-produced here. Whilst every possible effort has been made to make contact with all copyright holders I understand that there may be rare occasions when I have made a mistake. If you have any information regarding incorrect or inaccurate copyright details for any of the material on this web site please contact Redwood World as soon as possible. This web site is designed to load as swiftly as possible and does not contain adverts or Flash applications. The larger photographs should be the only items that may take some time to download to your computer. Recent News: Giant Redwood tree reduced to a stump by "mistake"
Most people have heard of Giant Redwoods, possibly as Giant Sequoia or Wellingtonia, and probably know that they originate from somewhere in America. In fact, although relatively rare, they can actually be found in many towns in the British Isles. If you know where to look. First of all... Why look? Why the fascination? The answer is that they are such magnificent trees. Magnificent not just for their phenomenal size but also for their shape, their sturdy buttress style and soft spongy bark. When one looks up the trunk of a mature Giant Redwood and sees the slim branches sweeping gracefully downwards, there is an air of pre-historic mystique about them; and yet by contrast there is a fresh modern appeal about the smart conical shape of a juvenile tree. They might look as though they would make a good Christmas tree for the home but don't be fooled by appearance because the needles are sharp and firm and would cause injury to hands. A child falling against one could lose an eye. Best left in the ground where they are growing! On this site you will see the product of many years spent on locating, documenting, and photographing examples of these fantastic trees in the British Isles. Illustrated here you will find a growing selection of the magnificent, the mediocre, and even some of the downright peculiar examples. 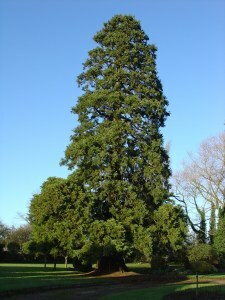 You will see examples of Giant Redwood (Sequoiadendron giganteum) also known as Wellingtonia, Coast Redwood (Sequoia sempervirens) and Dawn Redwood (Metasequoia glyptostroboides), all are fine trees although my preference is for the Giant Redwood also known as Wellingtonia or by the Americans as Giant Sequoia. There are also pages explaining the characteristics of Redwoods, how to measure them, how to grow your own and the stories from people who are growing their own redwoods. Use the buttons on the left to navigate, but if you are new to these trees and curious about what makes them so different, take a tour via the "Locations and Pictures" button. You will see a variety of examples, some in the middle of towns, towering over homes, shops and churches, others in the countryside, again towering over their neighbouring trees. You will see Giant Redwood and Coast Redwood trees of varying ages, but in the main they will be around a hundred to a hundred and sixty years old. Very young by their own standard, since they live for thousands of years, but they were only discovered and introduced to England in the 1850's. Although they were largely forgotten for a century or so, it seems that there is something of a revival in popularity, for there are now a small but growing number of very young examples planted over the last decade or so by adventurous organisations and councils in the UK. You will also find examples of Dawn Redwood, a rather unusual deciduous pine tree that was known only from fossil evidence until its discovery in China in the 1940's.